TODAY'S ACC HEADLINES: Opening Round Of The ACC N.I.T. VIRGINIA TECH 79, Bethune-Cookman (Wildcats, 4,00 students, Daytona Beach, FL) 54 – Jeff Allen scored 19 points to help Virginia Tech overcome the sting of not making the NCAA tournament with a win over Bethune-Cookman on Wednesday night in the first round of the National Invitation Tournament. Virginia Tech (22-11), making its 12th appearance in the NIT and fifth in eight seasons under head coach Seth Greenberg, will meet Wichita State in the second round on Sunday after the Shockers beat Nebraska 76-49. The Hokies connected on 10 of its first 11 shots and took a 23-9 lead after Allen’s basket with 13:01 left in the half. Virginia Tech led by as many as 23 in the first half and shot 61.3 percent (19 of 31). Bethune-Cookman (21-13), the regular-season champion in the MEAC, was making its first appearance in postseason play since 1980 as a Division II program. Delaney scored 13 points for the Hokies, who shot 55.6 percent from the floor (33 of 59), reserve Manny Atkins added 12 and Erick Green 11. Green and Delaney, Tech’s starting guards, combined for 13 assists—a career-high eight by Green—and no turnovers. Garrius Holloman led the Wildcats with 20 points. Top-seeded Tech (22-11) will host fourth-seeded Wichita State, coached by Cave Spring graduate Gregg Marshall, in the second round at 11 a.m. Sunday. MIAMI 85, Florida Atalantic (Owls, 20,946 students, Boca Raton, FL) 62 – Malcolm Grant scored 23 points and Miami beat Florida Atlantic in the first round of the National Invitation Tournament on Wednesday night. The Hurricanes outscored the Owls 15-1 during a 5:22 span in the second half to secure their 20th win of the season. 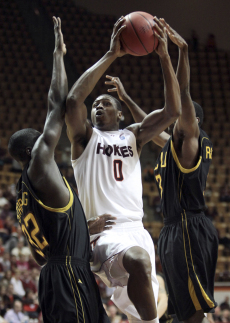 Durand Scott’s two free throws with 4:23 remaining capped the run and gave the Hurricanes (20-13) a 66-51 lead. Adrian Thomas and Scott hit consecutive 3-pointers early in the second half to give Miami a 45-30 lead before the Owls scored six unanswered points to stay within single digits. Greg Gantt’s basket with 12:23 remaining cut Miami’s lead to 51-45. Miami was coming off a heartbreaking loss to North Carolina in the ACC tournament. Scott scored 19 points while Reggie Johnson finished with 14 points and 20 rebounds for the Hurricanes, who will host Missouri State in the second round. Gantt led the Owls (21-11) with 17 points.